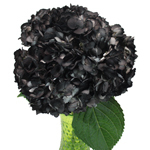 Add drama with the Black Enhanced Hydrangea Flower! 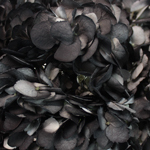 The white hydrangea is carefully tinted black to create a theatrical black and white bloom. Pair with classic white roses and hypericum berries or add in bold colors like dark purples for a nighttime soiree. With a spin on a classic bloom, the Black Enhanced Hydrangea Flowers are stunning for bridal and table arrangements. Airbrush tinting is a technique where a natural white hydrangea is spray-painted by hand. The concentration of the paint is stronger than intravenous, however it will not be a consistent shade. Some of the natural white may show through in spots for a variegated look. The spray paint may rub off a bit, use caution when processing and arranging (you may want to wear gloves and aprons to prevent stained hands and clothing). The flower tint may dye the water slightly if submerged, so please take this into consideration when making arrangements.